Before I say anything about my experience in general, I need to offer some thank yous to some truly inspiring people I met at Necronomicon 2012. These people provided me with wisdom, knowledge, friendship, and will even be new muses of mine: Brenda Cothern, T.S. Robinson, Bill Hatfield, K L Nappier, Lucienne Diver, JM Bolton, R.M. Garcia, Kat Heckenbach, , and Storm Moon Press (Saundra and Roger Armstrong, and Kristina Piet). Where do I begin... first, I have to say that I was made to feel like part of the Necro family from day one when I met Brenda. She greeted me openly and helped me understand how things worked at the Con. First impressions mean a great deal, and this one certainly made me feel welcome. After that, I met author after author, participant after participant, who just made my experience worthwhile. Panels. Well, they were certainly something I never thought I would enjoy, but I liked being in the spotlight, albeit for 55 minutes with other people. I found I had much to say for most of the panels (see my prior post for the list of panels I attended) except for Military SF. I think, because my novel has 'Task Force' in the title, I was selected to be on the panel. The other gentlemen there were much more well versed in the military themes in sci-fi (not really fantasy) and gaming. Ah well — it was an experience I needed to have. My time on the LGBT panels gave me more confidence to be an out gay man, especially with total strangers. After a few panels, audience members approached my table, complimenting me on comments I had made, and some even bought books because of that. Even though panel time means I don't have table time to promote and sell books, spending time with the groups on the panels helped shape my understanding of the Con culture. People. I had met Lakisha Spletzer earlier this year at a library book festival here in Land O' Lakes, and seeing her again gave me at least one person I knew in case I had a problem. Although I haven't read her works, from what I have seen I will enjoy them, so when I have more reading time, I plan on getting a few under my literary belt, so to speak. Congratulations to her and R.M. Garcia, another author who she had met at the Con last year—they got engaged this year at Necro. One of my table mates who sat across from me in the hotel, T.S. Robinson, not only provided me with a 'comrade-in-arms' as a fantasy writer, but also as an invaluable resource of information for table bling (how to decorate my table) as well as being a better salesman. I have so many ideas for next year. 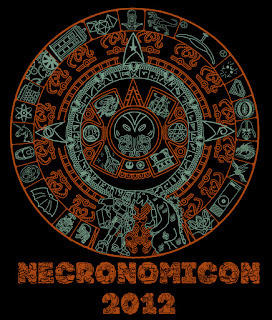 I want to Necronomicon 2013 to be an even better experience, and I have much to do. It's approaching 11 p.m., so I will have to add more later.